Navodaya Vidyalaya samiti, henceforth mentioned as NVS is an Autonomous organization under Minister of human resource development of school education and literacy Govt of India having its HQ at NOIDA (Uttar Pradesh ). It has 08 regional offices Bhopal, Chandigarh, Hyderabad, Jaipur, Lucknow, Patna, Pune & shilling and more than 600 Jawahar Navodaya vidyalayes which are co-educational, fully residential schools up to senior secondary level and located mainly in rural areas all across the country except in the state of Tamil Nadu. NVS invites Online application from Indian citizens for recruitment to various non-teaching post viz. 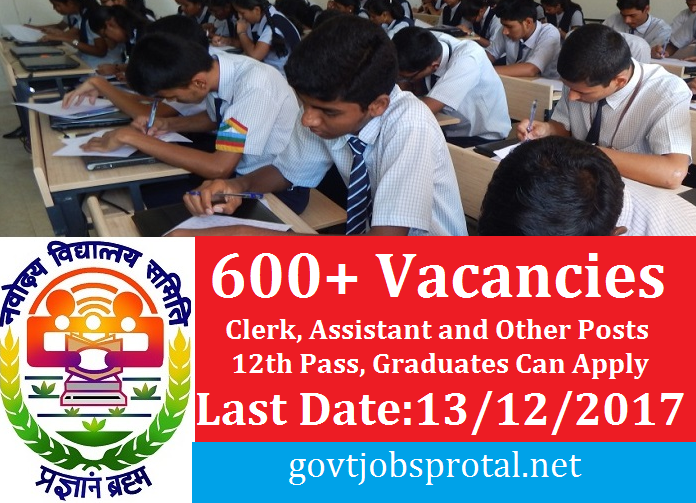 female staff nurse catering assistant lower Division clerk /storekeeper ,lab attendant in jaaowahar Navodaya vidyalayas and for the post of audit assistant ,Hindi Translator, Stenographer, Lower Division Clerk in NVS HQ/ Regional offices. (Master’s Degree from the recognized university in Hindi/English with other language than Master’s degree at graduation level.